You can build this comfortable glider and ottoman in your home workshop. All easy straight cuts and curves. #W2319 Child Size Rocker measures 22"W x 32"H x 19"D and requires 5 of the #1240 9" Oak Spindles. 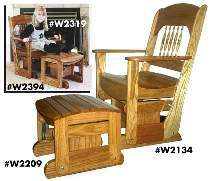 #W2134 Adult Rocker measures 28"W x 40"H x 24"D and requires 5 of the #1241 11" Oak Spindles. Order two sets of glider brackets if making both the rocker and ottoman for either the adult or the child size versions. Plans and accessories sold separately. #1175 Special includes 11" oak spindles, glider brackets and #W2134 Adult Rocker Plan. #1565 Special includes 11" oak spindles, 2 sets of 4 glider brackets, #W2134 Adult Rocker Plan and #W2209 Adult Ottoman Plan.